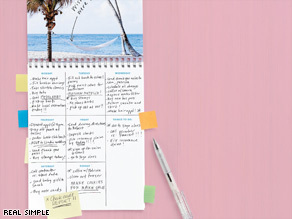 The 14-day plan suggests laughing, helping others and looking at the "big picture"
(Real Simple) -- Feeling overwhelmed? Stop stress in its tracks with this 14-day relaxation regimen. Here's a plan aimed at reducing your daily stress. Monday Day 1: See the big picture. When obstacles pop up, ask yourself how stressful the situation really is: Will this matter in three months? Three years? For issues with long-term repercussions, write down exactly what you think the problem is or how the situation needs to change. Brainstorm about what you can do to move toward a better outcome, itemize the steps that must be taken, then create a concrete plan of action. Wednesday Day 3: Plant something. Whether it's a window box or a row of bulbs, caring for greenery can have a positive effect on your well-being. A recent study put heart-disease patients in a horticultural-therapy class. Immediately after the class, their heart rates were lowered and their moods improved. Gardening can help shift the focus away from the stressors in your life and calm you down. Friday Day 5: Get a chair massage. These short massages now offered in salons, malls, and airports can work wonders on chipping away accumulated stress. Even a 15-minute massage can calm nerves. Or try this DIY solution a few times a day: Place your left hand in front of you, palm-side up with your fingers together, and using your right thumb, massage the fleshy spot between your left thumb and index finger in a circular motion while you slowly count to 15. Saturday Day 6: Play on the web. Doing online puzzles, like solitaire or sudoku, can decrease stress and improve mood, according to research from East Carolina University, in Greenville, North Carolina. Because you're distracted from your worries by the game, your nervous system can relax. Find a game you like, one you become so absorbed in that you lose all track of time, and play it daily. Monday Day 8: Think pink. You may find it too girly to wear, but, surprisingly, a bubblegum shade of pink originally called Baker-Miller Pink has been shown to have a temporary soothing effect, actually lowering blood pressure. To add a little pink to your day (without repainting your office), make your screen saver a bright pink image, store papers in pink file folders, put a pink pillow on your chair, or jot memos on pink Post-it Notes. Tuesday Day 9: Turn off the TV. Constant bombardment by news can make you feel anxious when you're already keyed up, and a blaring TV hits you with both visual and aural stimulation. Consider a quieter, more single-sensory form of news whether it's the morning paper or the car radio. And limit your news to one source to keep from being overwhelmed. Wednesday Day 10: Take the scenic route. Whenever possible, get off crowded city streets and busy highways and take a tree-lined road to your destination. A study showed that the frustrations of commuting are somewhat eased if you travel down streets with views of vegetation. Thursday Day 11: Untie your knots. Several times a day, scan your body from top to bottom, focusing on the areas that are most vulnerable to stress-related muscle tension. Consciously release the muscles in your forehead, eyes, lips, tongue, jaw, lower back, and toes. Friday Day 12: Give bad thoughts the stop sign. Negative thinking can fuel stress. So when damaging, unhelpful thoughts come to mind, ask yourself: How could I look at this in a more positive or at least a neutral light? Or try visualizing a giant red stop sign in front of these thoughts. Then take a few slow, deep breaths and decide whether you need to dwell on the negative or can think about something more upbeat. Saturday Day 13: Lend someone a hand. Help a colleague who's in a jam, sign up to mentor a student, or volunteer at a women's shelter. Reaching out to someone else gets you away from your own worries, puts things in perspective, and can make you feel better about yourself and your circumstances. Sunday Day 14: Plan to laugh. Research has found that feel-good endorphins start cranking and the mood-boosting benefits kick in as soon as people start anticipating having a laugh, and a good belly laugh can relax your whole body. So TiVo The Office and let the good vibes start flowing.